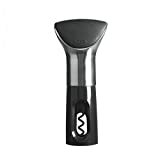 Oxo Steel CorkPull Wine Opener/Corkscrew – My Home Wine Bar ! Amazon Price: $24.99 $19.99 You save: $5.00 (20%). (as of February 3, 2019 2:11 am - Details). Product prices and availability are accurate as of the date/time indicated and are subject to change. Any price and availability information displayed on the Amazon site at the time of purchase will apply to the purchase of this product. The OXO SteeL CorkPull simplifies the task of opening a bottle of wine with no awkward or strenuous pulling. Turn the soft, comfortable knob to lower the non-stick screw into the cork. Just keep turning in the same direction until the cork lifts out of the bottle. It’s that easy! Use our CorkPull on any size bottle. The CorkPull also includes a comfortable and easy-to-use foil cutter built into the soft knob.